CHARM BEADS & CHARM BRACELETS : LOVE2HAVE in the UK! The BEST! Quality charm beads and charm bracelets all handmade in the UK at prices you can afford, fully guaranteed and returns accepted. The worldwide market for charm jewellery has been phenomenal over the past several years, and we are sure that all our customers will be aware of what we can only describe as a craze in collecting charm beads that sit strung together on a bracelet. However, to be quite honest, we remain somewhat unimpressed with the entire sector in this part of the jewellery industry. Customers have communicated to us in the past as to how these items are overpriced and also quite flimsy. We have heard stories of these charm bracelets breaking (they are after all only thin silver snake chains made abroad) and losing all their precious and well-earned charm beads at the same time. Retailers won't cover for this damage and probably not for any loss either. After some considerable thought regarding this type of jewellery, we wondered whether it would be possible to create a range of charm beads and bracelets that was influenced by this market, but at the same time produce something of a much higher quality and also very individual. This task was going to be tough. How are you to compete against something which in our opinion is quite tacky, mainly tasteless and above all expensive? We knew we could do better and one day one of our designers came up with this fantastic range. Being such a specialist type of jewellery it was important to design a collection of charm beads and bracelets that would be suitable for everyone, and here we have it, Star signs, we all have one, and there is nothing more personalised when it comes to your birthdate. This collection features every sign of the Horoscope for both the bracelets and the beads. The Zodiac bracelets are very substantial and once threaded your charm beads stay securely in place. 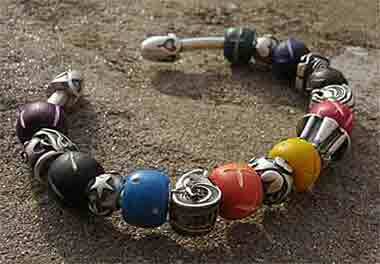 We have thought carefully about the charm bracelet too, and being a torq style, it won't snap and is built to last. The jewellery is available in two finishes, oxidised matt and polished and yes, even returns are accepted, but we are so confident that you will love them so much we don't expect this to be the case.